Serving areas: Grand Junction Colorado including Fruita – Palisade – the Grand Valley – Mesa County – the Western Slope and beyond. Bananas Fun Park is an indoor and outdoor family entertainment center (FEC) located in beautiful Grand Junction, Colorado – serving the western slope of Colorado and beyond with inflatable fun rentals, amusements, parties, etc. Attractions at Bananas Fun Park include the huge indoor Inflatable Playland, Go-Karts, Mini-Golf, the Arcade, Bumper Boats, Batting Cages, Kiddie-Karts, Lazer-Tag, a Lazer-Maze, mini-bowling, great food including pizza and snacks at the Congo Cafe (catering available) and more. Serving areas: serving the Grand Junction Colorado area and beyond. Bump n Jump is an inflatable rentals company serving the Grand Valley of the Western Slope of Colorado and beyond with great bounce entertainment. Book your bounce house or moonwalk rental today by calling 970-243-0070 or find more information on bounce houses for rent, inflatable slides, obstacle course and interactive inflatable rentals, dunk tanks, and more. 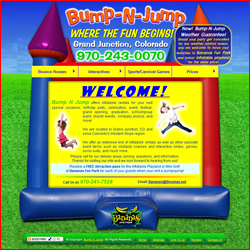 Jump Around Canon City provides inflatable rentals from the Canon City Colorado area. Offering great bounce houses, inflatable slides and combo units, obstacle courses, water slides, pony hops, and more! Contact Jump Around for your next special event in the Canon City area and beyond including birthdays, barbecues, school events, daycares etc. . . . Activate this business listing. Fun Productions Inc – Specialty party rentals for your Colorado Events – large or small. Games, inflatables, rides, carnival, casino night, theme event rentals and so much more . . . Activate this business listing. Front Range Inflatables has a bounce house rental for your party or event or for any occasion! Out of Erie Colorado, Front Range Inflatables delivers to the Northern Colroado area and Denver and the surrounding communities. Great Bouncey House Rentals and Jumping Castles for a safe and fun experience! . . . Activate this business listing. A Bouncy Bear has your Denver area Bouncy Rentals, Interactives, Party Supplies and Concessions Equipment, Casino Equipment, Entertainers, and more. Contact A Boucy Bear for specials and for information on booking your inflatable rental for birthdays, festivals, and more . . . Activate this business listing. Serving areas: Denver – Colorado Springs – Ft Collins and the Front Range of Colorado and surrounding communities. Big Air Jumpers is an inflatable rentals provider serving the Front Range of Colorado including Denver, Colorado Springs, and Northern Colorado. As one of Colorado’s largest inflatable companies, Big Air Jumpers offers a wide variety of inflatable rentals, licensed and traditional bouncers, combo units, obstacle courses, interactives and . . . Activate this business listing. Jump to It has great party and event rentals for the Aurora Colorado area and Denver metro. Jump to It provides affordable and safe fun – make your reservation early and know that Jump to It Bounce Houses takes safety first! Attendants and generators are also available to rent with your inflatable equipment. Check rates and availability and the bounce house gallery online and more . . . Activate this business listing. Serving areas: Denver metro – Northern Colorado – Southern Colorado – Colorado Springs to Ft Collins. Blaster Bouncer serves the Denver metro area and most of the Front Range of Colorado with Bouncers, Slide Combos, Water Slides and Games, Large Games and Carnival Games, Obstacle Courses, Fun Food, Table and Chair and Tent Rentals, Movie Screens, and more . . . Activate this business listing. Jolly Jump serves the Colorado Springs Colorado area with inflatable bounce house entertainment – pick a jumper – let Jolly Jump know your event date – and your affordable inflatable rental will be delivered with quality and exceptional service. Pucker Powder machines and Popcorn concessions also available. . . Activate this business listing.